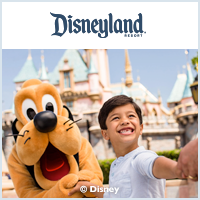 Located 1 mile from Disneyland with complimentary shuttle running every 20 minutes. At this luxury resort Guests have a choice of spacious 1-bedroom suites, which can accommodate four guests, or a 2-bedroom suite, which can accommodate a party of six. There are 371 guestrooms. Complimentary breakfast is served. Room amenities include room service, cable TV, two line phones with data port and voice mail, iron/ironing board, hairdryer, refrigerator, microwave, coffeemaker and daily newspaper (Mon-Fri). Guests can enjoy the heated pool, Jacuzzi, exercise facility, gift shop, concierge desk, game room and Laundromat. Handicap accessible rooms are available. Pets allowed with a non-refundable sanitation fee. (Contact the hotel for restrictions). Close to Starbucks and Outback Steakhouse as well as other restaurants. Located 1/2 mile from Disneyland. Transportation via ART (Anaheim Resort Transportation) for a nominal fee. This hotel offers 112 suites, some with bunk beds, and is in a prime Anaheim location, within a short walk of the Disneyland Resort. A heated outdoor pool, fitness center, and a handy gift shop are conveniently located onsite, and the hotels WiFi has been recently upgraded. Enjoy family-friendly accomodations in this newer Anaheim resort hotel. Take a swim in the outdoor pool, enjoy the hot tub, relax at the onsite bar or chill in the movie theater room. Each morning, fill up on a hot complimentary breakfast. The 174 rooms and suites include in-room coffeemaker, free weekday newspaper, refrigerator, microwave, and free wifi. The Desert Palms Hotel & Suites is conveniently located behind California Adventure and across from the Anaheim Convention Center. This hotel's amenities include complimentary Continental breakfast, heated pool and fitness room. The Desert Palms Hotel & Suites has a Quizno's and the Sandbox Bar and Grille. Note that this hotel is 100% non-smoking. The guest rooms feature a refrigerator, microwave, high-speed internet access, in-room safe, coffeemaker, hairdryer and iron/ironing board. The hotel rooms can accommodate 2 to 4 guests while the suites can accommodate 4 to 8. The 8 person kid's suite has bunk beds and a pull out double bed for the little ones, with two queen beds in the adjacent room. The Doubletree Guest Suites is elegant and welcoming. On the second floor is the outdoor heated pool, arcade and fitness center. The full serve Agio restaurant offers California/Italian cuisine and has an outdoor dining patio. Kids 12 and under eat free. (This offer is good for one child per one paying adult. The adult must order an entree.) There's also the Grappa Lounge where cocktails and bar snacks are available. At Cafe Biscotti, specialty coffees, snacks and pastries are served. The spacious guest rooms and two room suites include high speed internet access, a ergonomic desk chair, coffee maker, refrigerator, microwave, iron/ironing board and hairdryer. The bedding is the signature Sweet Dreams by Doubletree featuring a plush top mattress with triple sheeting, down comforter and oversized pillows. Located 6 miles from Disneyland. Hotel shuttle service runs hourly with a lift available. The Embassy Suites Hotel Anaheim North has a soaring seven story atrium with waterfalls, koi ponds and comfortable seating areas where you can relax and enjoy the surroundings. This Hotel features a complimentary cooked to order breakfast and a nightly Manager's reception where snacks and beverages are served. Other amenities include an exercise faility, Jacuzzi, heated pool, dry sauna, concierge desk, gift shop, jogging track, laundery center, onsite restaurant and lounge. The guest room amenities include: two line phones with data port and voice mail, iron/ironing board, hairdryer, cable TV, Nintendo (fee based). Wireless Internet access is available from the guestroom or anywhere in the atrium/public space for a fee. The Embassy Suites Hotel Anaheim South has a beautiful 14 story atrium filled with lush plantings, a 14 foot waterfall and koi ponds. This Hotel features a complimentary cooked to order breakfast and a nightly Manager's reception where snacks and beverages are served. This modern facility offers a heated pool, Jacuzzi, exercise facility, gift shop, restaurant, lounge, game room, and driving range. There are 375 suites all of which have separate living and sleeping areas. Connecting rooms are available. Room amenities include: cable TV in each room, refrigerator, microwave, wet bar, coffeemaker, phone with data port and voice mail, USA Today, iron/ironing board, hairdryer, Video games (fee based) and hand-held shower. Handicap accessible rooms are available. Located 1 mile from Disneyland. Complimentary shuttle service. This hotel will feel like a second home with it’s spacious, new 1-bedroom suites. Each suite can accommodate up to six guests making it perfect for families. A complimentary hot breakfast is served each morning. On Mondays through Thursdays, guests are invited to an evening Manager’s reception for beverages and light snacks. There’s a guest library for those looking for a quiet getaway. Guests can enjoy the heated pool, children’s wading pool, Jacuzzi, exercise facility, gift shop, Laundromat, and business center. There are 166 one-bedroom suites. Room amenities include: fully equipped kitchen with microwave, refrigerator, coffeemaker, cable TV with video games, Web TV and CD player, two phones with dual lines, data port and, complimentary high speed internet access, iron/ironing board and hairdryer. Handicap accessible rooms are available. This new extended-stay hotel in the heart of the Anaheim Resort area offers spacious suites featuring separate living and sleeping areas and full kitchens. Family suites offer bunk beds! A hot breakfast is available each morning and a complimentary evening social is offered weeknights. Outside you'll want to check out the heated swimming pool, fire pit, putting greeen, sports court and barbeque area. Located 1/2 mile from Disneyland. Transportation via ART (Anaheim Resort Transport) for a nominal fee. This new home-away-from-home at the central corner of Katella & Harbor offers contemporary decor, inviting social spaces and generous amenities. The spacious rooms and suites offer separate living & sleeping area and full kitchens, plus some offer bunkbeds or views of the nightly fireworks. The hotel offers a complimentary hot breakfast each morning in the lounge and the Hyatt's Sip+Savor Menu is available at the H Bar each evening. An outdoor pool is available along with a 24-hour fitness center. This newer hotel, combining style and innovation, boasts 178 rooms, some featuring family-friendly suites with bunk beds, and all including a sectional sofa-sleeper and Hyatt Grand Beds. All rooms have state-of-the-art media and work centers with a 42" HDTV. The Hyatt Place offers free hot breakfast, free WiFi, complimentary public computers and 24-hour StayFit gym. Their Coffee to Cocktails bar offers specialty coffees & pasteries in the moring, then premium beer, wine & cocktails later in the day. Located 1 block from Disneyland. Transportation via ART (Anaheim Resort Transportation) for a nominal fee. This newer hotel located adjacent to the Anaheim Convention Center features spacious suites with separate living and sleeping areas, plus kid's suites with brightly themed bunk ands and a separate bathroom. Suites include a fully equipped kitchen and free grocery shopping delivery service, plus hot breakfast buffet daily. The rooftop pool includes a splash zone, hot tub, and cabanas, plus an expansive view. Located 1 block from Disneyland. Transportation via ART (Anaheim Resort Transport) for a nominal fee. Enjoy the comforts of home, such as a mini-refrigerator, microwave and coffeemaker. The comfortable living area features a pullout sofa and ergonomic work chair & desk. Complimentary hot breakfast is served in the lobby. The heated pool will help you relax and the modern fitness center will keep you energized. Located at the busy corner of Harbor & Katella, this hotel features large and luxurious suites, along with the comforts of home, such as a mini-refrigerator, microwave and coffee maker. The "living space" includes a pullout sofa and ergonomic work desk & chair. The kid's suites feature bunk beds and the rooftop pool offers a view of the fireworks. A CVS and A Coffee Bean are attached.